+ 2 = 10 Required Please enter the correct value. The Dow Jones today opened over 100 points higher as investors waited for the U.S. Federal Reserve's Open Market Committee meeting. The Fed is expected to raise interest rates by 25 basis points and reaffirm its commitment to issuing two more hikes within the next year. Now here's a closer look at today's most important market events and stocks, plus Wednesday's economic calendar. The markets are preparing for the first day of the Fed Open Market Committee's meeting on monetary policy. 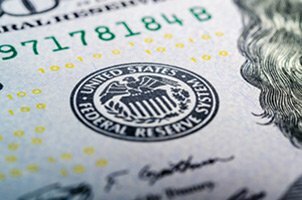 The FOMC is largely expected to raise interest rates for the first time in 2018. The question moving forward is whether the central bank will raise interest rates three or four times overall over the next 10 months. Gold prices are falling despite growing uncertainty over the health of the U.S. economy. The Atlanta Federal Reserve has significantly reduced expectations for first-quarter GDP growth from 5.4% to 1.9%. Several banks like Goldman Sachs Group Inc. (NYSE: GS) and JPMorgan Chase & Co. (NYSE: JPM) slashed their Q1 GDP estimates to 2% or less. Bitcoin was up 3% early Tuesday, as markets slowly rebound from a sell-off over the weekend. On Monday, U.S. President Donald Trump signed an executive order that bars all American transactions in the new "Petro" cryptocurrency, a digital currency issued by the Venezuelan government. Multiple U.S. officials have called the Petro a "scam." Venezuela's opposition party has also called the Petro illegal and an effort to undermine democracy across the nation to cement Maduro's rule. Crude oil prices pressed higher Tuesday due to a downturn in Venezuela's oil output and rising tensions across the Middle East. Venezuela, which has the largest proven oil reserves in the world, has experienced a dramatic collapse of its oil industry over the last decade. Meanwhile, tensions are rising in the Middle East after Prince Mohammad bin Salman, of Saudi Arabia, told "60 Minutes" last week that his country would pursue nuclear weapons should Iran develop its own nuclear program. The WTI crude oil price today added 1.3%. Brent crude gained 1.3%. Prince Alwaleed bin Talal gave his first interview since finding himself caught in his country's recent anti-corruption sweep. It has been three months since the billionaire prince was dragged into Riyadh's Ritz-Carlton and effectively forced to break up his business empire. In an interview with Bloomberg, Alwaleed said that he is likely going to spin off his property business in the near future. Alwaleed is a major investor in U.S. firms like Twitter Inc. (NYSE: TWTR) and Citigroup Inc. (NYSE: C). FedEx Corp. (NYSE: FDX) leads a busy day of earnings reports. The shipping giant is expected to report earnings per share (EPS) of $3.09 on top of $16.18 billion in revenue. Despite the positive report expected by Wall Street, a crisis in Austin, Texas, is likely to overshadow today's events. According to authorities, a package packed with nails and bound for Austin exploded at a FedEx facility. Police are fearing that a serial bomber has been operating in Texas after similar explosions in recent weeks. Shares of Facebook Inc. (Nasdaq: FB) face new pressure after a report that British data firm Cambridge Analytica obtained data on millions of Facebook users without the company's permission. The company's top security chief has left the company in the wake of the Russian disinformation scandal that continues to plague Facebook's reputation. Shares of FB stock fell more than 7% on Monday. Oracle Corp. (NYSE: ORCL) slumped 8.2% Monday after the firm reported earnings for the quarter. Even though its EPS figure of $0.83 topped analysts' expectations by $0.11, the firm fell short of Wall Street's revenue forecasts. The firm also reported a weaker-than-expected outlook this quarter for revenue in its hyper-competitive cloud computing business. Look for additional earnings reports from The Children's Place Inc. (Nasdaq: PLCE), AAR Corp. (NYSE: AIR), Steelcase Inc. (NYSE: SCS), and DXP Enterprises (Nasdaq: DXPE).